This data set represents ongoing identification, characterization, and mapping of small vents across the Tharsis province utilizes MOLA, Thermal Emission Imaging System (THEMIS), and High Resolution Stereo Camera (HRSC) data. Volcanic vents are spatially cataloged as single points, referencing their plan view position with respect to the THEMIS IR day-time mosaic and the gridded MOLA dataset base maps. Each datum is assumed to represent the four-dimensional (space and time) pathway along which magma ascended through the crust to erupt at the surface and produce an identifiable vent structure. Within this catalog volcanic vents are defined as positive topographic landforms, tens to hundreds of meters in height, with flows or flow-like textures radiating from the apex and/or summit depressions. Many positive topographic landforms lack clear flow features or a preserved depression at the apex, but are otherwise morphologically similar to cataloged vents. These landforms, which are tens to hundreds of meters in height, are also cataloged. It is assumed that many volcanic vents that formed across the Tharsis region have since been buried by continued volcanism or other processes. This catalog provides no inferences about buried vents, nor does this catalog provide any information about stalled magma bodies for which ascension pathways were established but did not lead to surface. Instead, vents that are currently identifiable on the surface are assumed to represent the last stage of eruptive activity in the region. This catalog does not differentiate vent types based on morphology (fissures vs. shields) or inferred eruption conditions. Each point simply represents a site at which we believe magma was erupted onto the surface of Mars. New vent features are identified as data collection continues at Mars and the catalog will be updated appropriately. Thus, this dataset can be used as a starting point for future projects that investigate distributed volcanism across Tharsis. * Richardson, J.A., et al., 2013, The volcanic history of Syria Planum, Mars, Journal of Volcanology and Geothermal Research 252, pages 1–13, doi:10.1016/j.jvolgeores.2012.11.007. * Bleacher, J.E., et al., 2009, Spatial and alignment analyses for a field of small volcanic vents south of Pavonis Mons and implications for the Tharsis province, Mars, Journal of Volcanology and Geothermal Research, Volume 185, Issues 1–2, 10 August 2009, Pages 96–102, doi:10.1016/j.jvolgeores.2009.04.008. * Bleacher, J.E., et al., 2007, Trends in effusive style at the Tharsis Montes, Mars, and implications for the development of the Tharsis province, Journal of Geophysical Research, 112 , p. E09005, doi:10.1029/2006JE002873. We hypothesize that fields of small vents in the Tharsis province are representative of significant magmatic events much as they are on the Earth, and that together with detailed mapping, statistical studies will provide insight into the role that small vent field formation played in the development of the province. This catalog does not differentiate vent types based on morphology (fissures vs. shields) or inferred eruption conditions. Each point simply represents a site at which we believe magma was erupted onto the surface of Mars. New vent features are identified as data collection continues at Mars and the catalog will be updated appropriately. This dataset can be used as a starting point for future projects that investigate distributed volcanism across Tharsis. 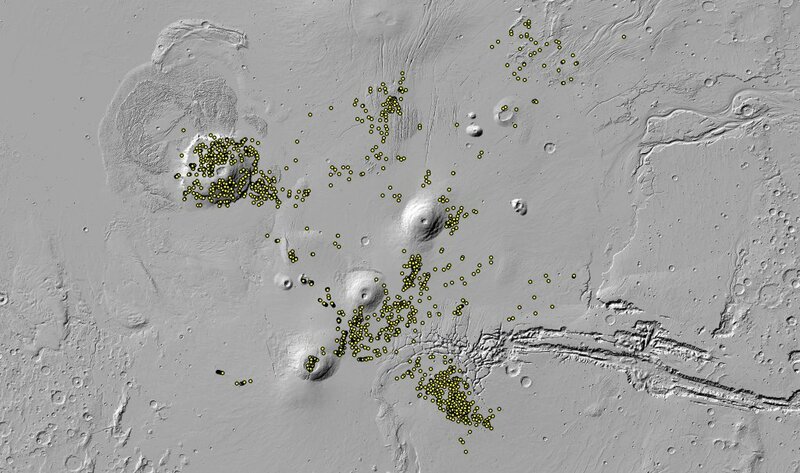 Each point simply represents a site at which we believe magma was erupted onto the surface of Mars.